Dr. K.P. Yohannan has been crisscrossing the globe for the last 40 years, challenging the Body of Christ to discipleship and an all-out commitment to Jesus. He is also a prolific writer with more than 200 books published in Asia and 9 in the United States. To the Church caught up by the tidal waves of compromise and self-preservation, Yohannan’s life message is a fresh word to this generation and yet as timeless as the scriptural mandate itself. Born in India, Dr. Yohannan responded to the Lord’s call to serve Him at the age of 16. Later, Yohannan came to the United States and received his theological education at Criswell College in Dallas, Texas. 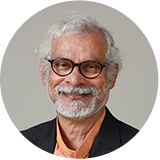 Today Dr. Yohannan is seen as a pastor to pastors and mission leader to mission leaders. For his faithful service to the Body of Christ, he was awarded an honourary Doctor of Divinity degree from Hindustan Bible College in Chennai, India. Ministering hope and practical help to the people of South Asia, his radio programme, Spiritual Journey, reaches more than a billion people in 113 languages. Additionally, Dr. Yohannan’s Road to Reality radio program airs weekly on more than 900 radio stations in the United States, Canada, Europe, Australia and New Zealand. In recognition of his service, the National Religious Broadcasters Association (NRB) presented to Yohannan their Individual Achievement in International Broadcasting award in 2003. Yohannan serves as the founder and international director of GFA World, a Dallas-based missions organization that is sharing the love of Christ in 14 South Asian countries. K.P. Yohannan and his wife, Gisela, have two grown children who are both serving the Lord with their families. The Potter Works Only with Soft Clay! What Can We Learn from the Tsunami? Should We Wait Until the Sun Comes Out? About 5 Minutes with K.P. 5 minutes with K.P. is a short devotional that first appeared in our ministry magazine, GFA World and is written by GFA World's Founder and Director, Dr. K.P. Yohannan.